In this car we (yes I had a friend help) T.P. 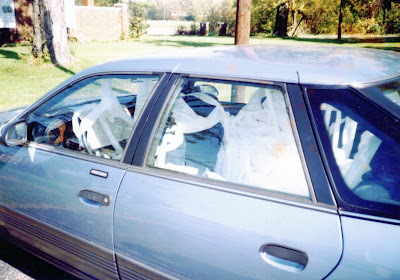 the inside of his locked car. Yes it was locked. Yes I cheated and looked into his owners manual for the combination to his car. We did take it one step further, we took a clean diaper and mixed peanut butter and mustard, it looked like a real chitty thing. In the picture below, the neighbors asked me and a friend to watch their house and car while they were on vacation. 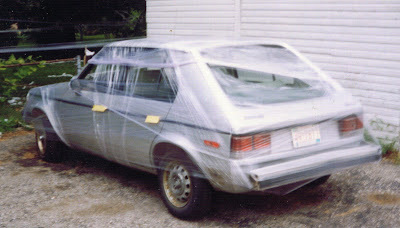 We took very good care of the car. We made sure no one would get into it. Me: I don't know what you are talking about. Dad: Don't play dumb whit me mister. Me: Have fun cleaning that mess up. Dad: Your turn is coming. OMG Do you know where I live? No? Good. I don't think I would have much of a sense of humor if I was your victim. I hate to clean messes up. I am sure it was much more fun to pull the prank than to clean it up. Thought you might like to know- my 3 year old granddaughter loves your profile picture. She told me you were waving at her. She stood at my computer and waved back. You have a new friend Allen. @ Larry, LOL no I dont know where you live. I only have done it to friends that I knew, would only hate it at the moment. I don't pull them on others. @ Rae, It was fun pulling the pranks, and yes I helped clean up the messes. Except for my fathers office. I was traveling out of town when he found his in such a mess. You are a SUPER JOKESTER!!! LOL!!!! Those are pretty good, and funny, as long as they aren't played on ME!!! LOL!!! BTW, I saw the roses awhile back.... THANK YOU!!! Have not been spending as much time online as I like to, but will keep stopping by from time to time!! HAHAHAAHA. Remind me to never get on your bad side. Good thing I live in a house on wheels. You'll never catch me. Mwaa-haa-haa!